It’s another tough Monday morning. EDSA is as usually heavy but moving… so here is my chance to spot billboards again. Thank God Faith is gone, oh i mean her poster has been removed. I just see usual faces like Judy Ann, Kris Aquino, Maja Salvador, Sam Milby and some namei starlets models whose face have been there for the longest time. Guess who is conquering the billboard arena these days… Marian Rivera. A lot of companies are loving her face now. She also has an album, a dance album to be exact, which i think is good because I don’t remember watching her sing or maybe she should not sing 😛 Telecommunications giant PLDT got her as an image model for their Prepaid Landline Plus…that poster approaching Guadalupe is not the ‘Faith Cuneta’ type of poster which you can easily strip down in less than an hour. It’s definitely…certified billboard. So what is the catch? Have you noticed her legs in that BillBoard? I think the printing is messed up. I was looking at it closely as i traverse EDSA along Boni. I thought it was just the framing but the thigh seems to have discoloration. Very far from the thigh above. It is a nightmare if those thighs have that tone. Could she be the next bill board queen? will her face stand the test of time? or will she be just like the others who are nowhere to be found now? i’d like to drop names but i’ll save that on my next post. Driving in EDSA is such an experience, there are a lot of surprises on this highway that awaits you from traffic jam, accidents, j-walkers to MMDA encounters. One thing I love though in driving at Highway 54 (EDSA’s old name), is looking at the colorful billboards. I find it amusing to guess who the featured celebrity/model is. A lot of billboards are also tastefully done. I have been haunted by this billboard, I almost tried taking a picture of the actual stuff but it’s difficult to park along EDSA not to mention the disgusting traffic. Luckily her website has this image. For the past days, looking at it from Cubao underpass, you’ll just notice her face full of eyes then everything else looks luminous until you see the purple and pink writings “FAITH SINGS SINATRA”. What the hell (WTH) happened to her face? The magic of Adobe Photoshop? Definitely there is something wrong with the nose… the poster in EDSA makes it appear that only the nostrils exist and the big eyes. I don’t know if the airbrush made it that ‘pointed’ but seeing articles on her recently concluded concert where Dr. Calayan was the ‘guest performer’, could it be that she is now a certified plastic fantastic? And the lips should suppose to look like that? This time, I think the theater make up artist needs scolding. 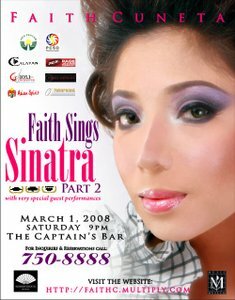 Maybe another picture will give a better image of Faith Cuneta but as for the ad above, I am — distracted. In fact its very annoying, she looks nice originally. Did Faith lose her name over her talent?